The spinal column is an intricate framework of interlocking bones that, when viewed from the side, form a gentle "S" shape. The spine is a sophisticated system—both fragile and sturdy—of muscles, bones, joints, ligaments, discs, a spinal cord, and nerves. Daily activities, such as lifting and exercise, or traumatic experiences, such as automobile accidents, can sometimes cause obvious, and at other times, subtle, problems with your spinal cord. 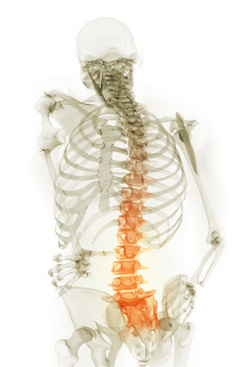 The most common problem involves a misalignment of the small bones in your spinal cord. We call these misalignments "subluxations." Often, these misalignments create pressure or irritation on the various nerves in your spine, and can cause a wide variety of symptoms throughout your body, such as localized pain, soreness, irregularity, and weakness. When pressure is applied on a nerve in your spine, the nerve energy is interrupted, and sometimes this can profoundly affect the function of other systems or organs in your body. Chemical component – Biochemical abnormalities can sometimes occur when one or more of the other vertebral subluxation components occur. Muscle component – Problems that occur when impinged nerves cause vertebral muscles to malfunction. Nerve component – "Neuropathology" is another term for this, which essentially refers to undue pressure on a spinal nerve. Osseous (bone) component – This occurs when one or more vertebrae are either not in correct position or moving improperly. Degeneration of the vertebral bones can cause this sometimes. Soft tissue component – When subluxations occur, they can affect the soft tissues, including ligaments and veins, surrounding your spinal cord. If it weren't for our remarkable nervous system, we might never know about most serious problems or be able to correct them before they get worse. You have developed any kind of pain in your joints or skeletal structures, such as your neck, back, shoulder blades, elbows, wrists, hips, knees, or ankles. You have developed problems walking, such as erratic movement, loss of rhythm or difficulty with your balance; this may be a sign of muscle weakness or other problem. You have developed sensory problems, such as numbness, tingling, burning, or localized pain. Nerves in your spinal cord branch off into sensory and motor nerves. A good example of this, and one that is common among people with back problems, is sciatica pain. Sciatica pain usually radiates down one leg or another. These types of sensory symptoms are not normal and may indicate a problem with the nerves in your spine. In some cases, these sensory problems radiate from one area to another. Your reflexes are diminished or absent. Reflex reactions are normal if you bump part of your body, such as a physician tapping your kneecap with an instrument. If no reflex reaction occurs in this instance, it could be a sign that you have incurred some kind of damage to your spinal cord, nerve root, peripheral nerve, or muscle.